NASA told space shuttle Discovery's astronauts Thursday that a spacewalk to repair a torn thermal blanket will not be necessary. Mission Control told the crew of seven that the shuttle will be safe for re-entry with the ripped blanket below the cockpit window. CBS News Correspondent Peter King reports that NASA had worried some of that lightweight material could shred and damage the orbiter. A different kind of debris hit Columbia two-and-a-half years ago. "We have cleared Discovery to re-enter and we have decided not to take any action on the thermal blanket because we think that it represents negligible concern at this time," deputy shuttle program manager Wayne Hale said. The space agency had been considering sending the astronauts out to snip away part of the blanket for fear a 13-inch section weighing just under an ounce could tear away during the return to Earth and slam into the shuttle, perhaps causing grave damage. But Hale said the risk of such a scenario occurring was minuscule. "We believe that the chances of anything untoward happening with this piece of fabric is remote," he said. He said there is a risk that the blanket could cause endanger the shuttle, but it is so small that another spacewalk would be unnecessary. "I am not here to tell you that we are 100 percent confident that there is no risk during re-entry. That would be untrue and foolish to even try to make that case," he said. "But what I am here to tell you is that we've assessed this risk to the very best of our engineering knowledge and we believe that it is remote, small, whatever adjective you want to put with that." 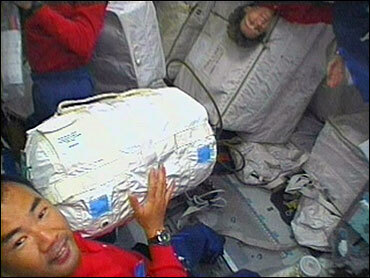 Replied astronaut Soichi Noguchi, one of the crew's assigned spacewalkers: "That's, I would say, good news." The shuttle is scheduled to return to Earth on Monday morning. Stephen Robinson made the Wednesday spacewalk to remove two potentially dangerous pieces of heat-resistant cloth protruding from Discovery's underside. He used his gloved hand to gently pluck the two strips from the crevices between the thermal tiles. CBS News Space Consultant Bill Harwood called the emergency repair job "a piece of cake." All the talk over the past couple days about this risky this how it's never been done before … well, it's never been done before, but he sure made it look easy," Harwood told The Early Show. It was the first time an astronaut had ever repaired the shuttle's exterior in space, and the first time one had ever ventured below the ship in orbit. "Robinson was barely back inside the shuttle and out of his spacesuit when Mission Control informed the crew about the chance of another spacewalk to deal with the torn thermal blanket. about returning home safely next week. Each crewmember took a few minutes to discuss space exploration and its costs and remember those who did not make it home. "We choose to do these things not because they are easy, but because they are hard," astronaut Wendy Lawrence said, borrowing the words of President Kennedy. "And certainly, space exploration is not easy and there has been a human price that has been paid." Columbia was doomed by a piece of insulating foam that fell off its external fuel tank during launch. The foam pierced a wing and caused the shuttle to disintegrate over Texas during re-entry on Feb. 1, 2003. Because of the tragedy, Discovery's astronauts have spent much of the mission inspecting their ship, making repairs and testing out new repair techniques. Discovery has been photographed and laser-analyzed in excruciating detail, and NASA officials have warned that some of the flaws they are spotting this time may not necessarily be reason for concern, or even anything out of the ordinary.